Born on the February 23, 1960, Rev. Sam Korankye Ankrah, the Apostle General is a father and a mentor to many. Reverend Sam Korankye Ankrah serves as the Apostle General of the Royalhouse Chapel International, a church in Ghana with more than 30,000 members. 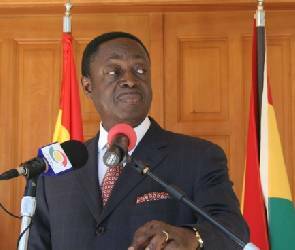 He is also the first vice president of the Ghana Pentecostal and Charismatic Council. Quite recently Rev. Korankye Ankrah and his team visited the Koforidua prisons to provide free medical care, drugs, meals and evangelism as part of a mega crusade being held by the Church in Eastern regional capital. Due to his love for humanitarianism, the work of God, touching generations and changing lives, AG as he is affectionately called had been much celebrated by many people home and abroad on his birthday. 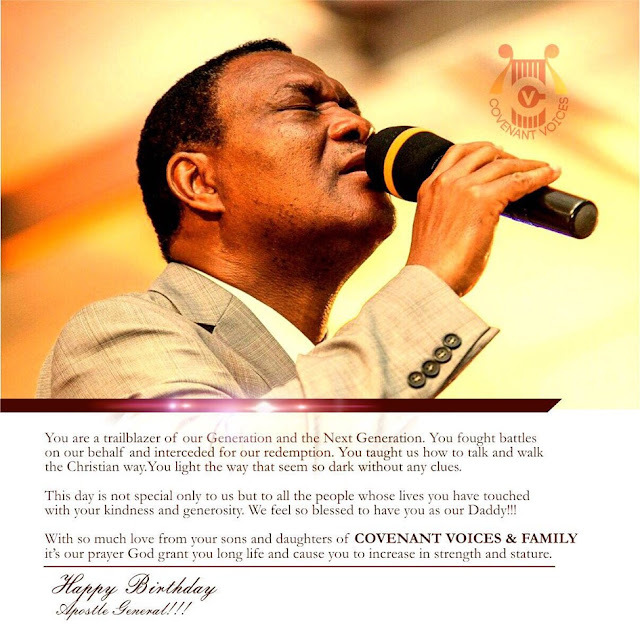 On the occasion of his birthday which is today 23rd February, Covenant Voices a dynamic Choir in Royalhouse Chapel salutes the Apostle General with touching and inspiring messages. [11:49, 2/23/2016]: You are a trailblazer of our Generation and the Next Generation. You fought battles on our behalf and interceded for our redemption. You taught us how to talk and walk the Christian way. You LIGHT the way that seem so dark without any clues. [12:01, 2/23/2016]: This day is not special only to us but to all those people whose lives you have touched with your kindness and generosity. We feel so blessed to have you as our Daddy!!! With so much Love from your sons and Daughters of COVENANT VOICES & FAMILY It's our Prayer God grant you Long Life and cause you to increase in strength and in stature. [12:09, 2/23/2016]: There should be a way of forwarding the summary or a summarized version of these birthday felicitations to Daddy. [12:09, 2/23/2016]: The man God has used to add meaning to my life and has made me to understand that it does not matter my background I destine for greatness I say Happy Birthday. AG may you live longer than you ever dreamt off. We love you father. [12:09, 2/23/2016]: Don’t think that your birthday is just a reminder of another passed year, because for me, it is the celebration that marks the birth of the best person I ever met in my life. God bless you, hoping He will keep you near for many years to come. till you become a blessing. [12:09, 2/23/2016]: You have blessed so many lives through your faithful ministry; may you be blessed greatly in return on this special day. All of us in this great family you have raised wish you a very happy birthday with many more to come. I Love you dearly! Live forever! [12:09, 2/23/2016]: Happy birthday to our Mentor, the APOSTLE of our generation. Thank you for teaching us and impacting our life with the word of God. May the Good Lord continue to bless you to take his devine presence to the peoples of the earth. [12:09, 2/23/2016]: Happy birthday to my Mentor, the APOSTLE Gen. of our generation. Thank you for teaching us and impacting our life with the word of God. May the Good Lord continue to bless you to take his devine presence to the peoples of the earth. [12:10, 2/23/2016]: Happy Birthday Apostle Gen. Let the strength and properity of heaven rain upon you, in the Matchless Undefeating Name of Jesus Christ. [12:10, 2/23/2016]: Hapi celebration to u Papa! May ur strength be renewed like dt of de eagle n wax stronger n stronger for de tax placed b4 u to accomplish! May de unique function on u increase n may all who taste of ur ministry hv a positive turnaround in Jesus' name! May ur day be full of surprises, Apostle G!! !